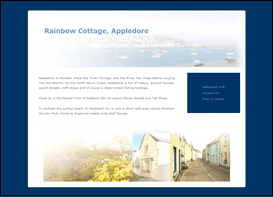 This project was a simple 4 pages site to enable a web presence for this quaint south eastern holiday cottage. The site features pictures, information upon the cottage and area, and has an integrated map from Google Maps. Graphic design of header artwork and colour scheme developed in Bunjys' Lair.